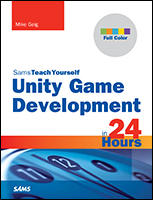 Hello everyone, in March of 2013 I developed a video series on the Unity 4 engine for InformIT and Pearson Publishing. The video series contains over 5 hours of content for those new to game development or just new to Unity. There are two ways to acquire the videos: You can purchase them from InformIT (link here) or you can watch them on Safari Books Online (link here).